I was so excited to get to work with the beautiful beads that Noemi Baena sent me from Spain. 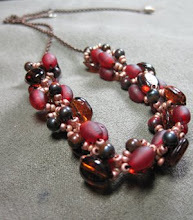 You can see what she came up with at her blog, fuego, metal, y color, from the materials that I sent. She made so many of the elements that she sent me by hand and I am so impressed! It really inspires me to want to go and start making more of my own components as well. The focal bead she sent me was an enameled bead by Susan Kennedy. I have never worked with this type of bead before or several of the metal components that she sent me and I tried a couple of different approaches before deciding that I needed to abandon my more usual approach of seed bead weaving and work with chain. But I can't give up my seed beads completely, so I incorporated them into the dangles. The clasp that she sent me was just absolutely beautiful and I didn't want to hide it away in the back, so I used it in the end to highlight the focal bead even more. I loved the mixture of oxidized and non-oxidized pieces that she sent me and it really encouraged me to go back to a palette of various kinds of coppery colors, totally appropriate as autumn begins to approach here in New York (and with it my return to graduate school!). I added some deep red beads from my own stash of beads as well as a couple of Czech glass beads that Noemi sent to highlight some of the red that can be seen in the enameled focus. Sadly, I don't think my camera does the colors on this one enough justice but hopefully you get a good idea of how beautiful and vibrant this palette looks together! There were a couple of Murano glass beads that I was sent as well, that didn't quite work with the earlier color scheme I was working with, but I just thought looked so beautiful with some of the other beads that I had been sent and so I decided to make just a simple bracelet and highlight some of the pale purple in the flowers on those beads and mix it with a few of the cream and tan beads that came in this soup. You can see in this picture that I've stolen from Noemi in order to highlight some of the other handmade components she sent the adorable little spirals and pinwheel type of metal beads that I used a tiny bit in the main piece. I absolutely loved these pieces but decided against making these pieces overly complicated by adding too much in one piece, but if you stay tuned I have a very special plan for these! I love the necklace, very beautiful designs. That’ a fantastic piece !Congrats! Beautiful designs, I love the simplicity of the bracelet. You did a very nice job incorporating your soup ingredients into your necklace! I love working with enameled beads! Beautiful Shiraz! I just love the necklace! Lovely creations...nice job on your bead soup! Nicely done, I like the way you highlighted both the focal and the clasp. Very creative, especially for not having worked in this medium. Great soup! A very simple, yet elegant, design. I really like it! Very pretty! The bracelet is my fav!! Beautiful! The deep reds work particularly well with Noemi's components. Lovely job! You sent a wonderful soup and have created something beautiful from the one you received. Beautiful and unique! Very cool creations! I love the little patterned links next to the enameled focal! Well done. Lovely necklace and bracelet. Totally two different feels. You did a Soup-er job with your bead soup! Great designs. I love your necklace. I love the enameled focal. You did a great job incorporating it. Those jack-type components are really fun. What really lovely pieces you made. You did a nice job working outside your comfort zone. Congrats on conquering this challenge! Lovely necklace, I love the flow-y feel of your pieces. The color palette is gorgeous! Wow! How beautiful they have turned up! I was so looking forward to see what you have made. I love the way you have used the clasp, it is so clever. It was a real pleasure working with you and your beads. I hope you didn't mind me saying I didn't like those eye beads , as I love the fact you sent them! The dangles on your necklace are great and make a wonderful piece. The bracelet is so fun. lovely use of your soup! you did a great job! Nicely done, thanks for showing your work! Fun and unique designs - great pieces! !